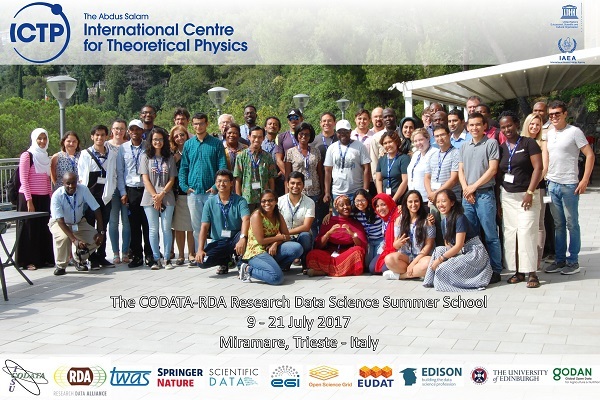 The CODATA-RDA Research Data Science Summer School and Research Data Science Advanced Workshops will run for their fourth and third year respectively at the International Centre for Theoretical Physics, Trieste, Italy. 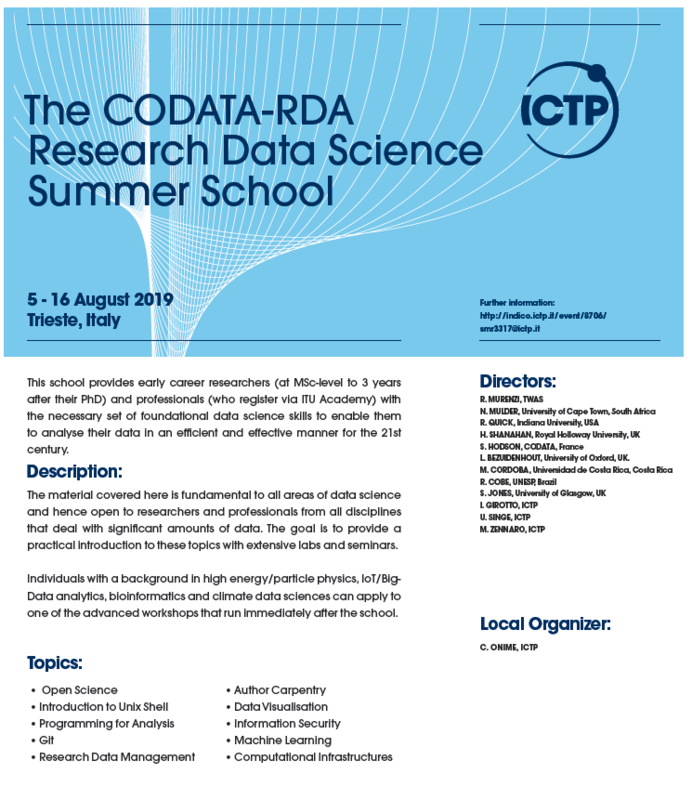 The CODATA-RDA Research Data Science Summer School will take place on 5-16 August 2019. Apply here! This school provides Early Career Researchers (at MSc-level to 3 years after their PhD) and Professionals (who register via ITU Academy) with the necessary set of foundational Data Science skills to enable them to analyse their data in an efficient and effective manner for the 21st century. The material covered here is fundamental to all areas of Data Science and hence open to researchers from all disciplines that deal with significant amounts of data. The focus is to provide a practical introduction to these topics with extensive labs and seminars. Individuals with a background in High Energy/Particle Physics, IoT/Big-Data Analytics, Bioinformatics and Climate Data Sciences can apply to one of the Advanced workshops that run immediately after the school. A limited number of grants are available to support the attendance of selected participants from developing countries. Professionals and corporate entities must register and apply via the ITU Academy platform. The CODATA-RDA Research Data Science Summer School provides training in the foundational skills of Research Data Science. Contemporary research – particularly when addressing the most significant, transdisciplinary research challenges – cannot be done effectively without a range of skills relating to data. This includes the principles and practice of Open Science and research data management and curation, the use of a range of data platforms and infrastructures, large scale analysis, statistics, visualisation and modelling techniques, software development and annotation and more. We define ‘Research Data Science’ as the ensemble of these skills. The School of Research Data Science has enjoyed a remarkable success and clearly responds to a burning need for data skills among Early Career Researchers and others involved in the research process, internationally.